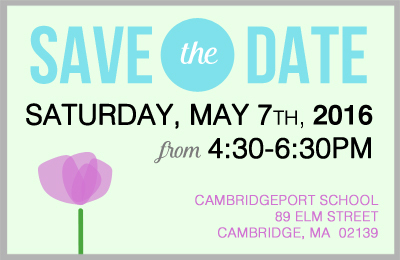 The Cambridgeport PTO is hosting its annual Spring Fling & Talent Show on Saturday, May 7th 2016 at Cambridgeport School. Family, friends, their families and their friends are all welcome! Suggested admission is $5 per person / $20 per family. Enjoy dinner, along with an all-(kid)-star show, featuring performances from our oh-so-talented Cport students. There will be crafts for little ones, door prizes and amazing silent auction items waiting to be taken (to your) home – and all for a great cause.